Emerald ash borer galleries found underneath ash tree bark. What are the consequences of the invasion by the Emerald Ash Borer (EAB) insect? The numbers are indeed staggering. We have a billion ash trees in Minnesota--many of them in our yards and gardens. And once the invasive insect, the Emerald Ash Borer infests a stand of trees, experts say to expect a mortality rate of 100 percent. Now University of Minnesota researchers are studying ways to make this storm cloud have a silver lining. They are studying innovative ways to use that wood for good. Emerald Ash Borer caught in a trap in Dodge County. It’s hard to avoid hearing about the emerald ash borer (EAB) and its effects on ash tree populations. Since it was first discovered in Minnesota in 2009, the beetle has continued to spread across our landscape, and the effects of the invasive insect are devastating: EAB attacks and kills nearly all ash trees greater than 1” in diameter. I spoke with Extension forestry educator Angela Gupta to find out what the impacts on Minnesota’s forests will be, and what experts are doing to mitigate the damage. The future seems pretty dire for Minnesota's ash trees. How many trees could potentially be killed by EAB? There are nearly 1 billion ash trees in Minnesota, and once EAB reaches a stand of ash the expected mortality for ash within the stand is nearly 100%. It is, and the loss of such a huge number of trees can have big impacts on the ecosystem, including changing the structure of wetlands, reducing species diversity, loss of habitat, and potentially allowing the introduction of additional invasive species. There’s also research that invasive plants thrive in the wake of EAB because more light and other resources are available for them to fill the niche left by ash (one more boon for buckthorn!). There are also huge economic impacts, including costs for removal or treatment (some people and communities choose to use insecticide injections to protect their ash trees, some do preemptive removals and replant), as well as the effects on the timber market. So how is the University of Minnesota working to reduce the impacts of EAB? A statewide working group called the Wood Innovation Team was formed to enhance and help innovate the state’s wood industry with the goal of enhancing Minnesota’s economic and environmental health. One of the project goals is finding innovative uses for wood products, such as the dead ash from EAB. The projects really run the gamut, from huge ideas like biofuels and mass timber (using timber to build tall buildings), to smaller projects like the demonstration project I’m working on right now. 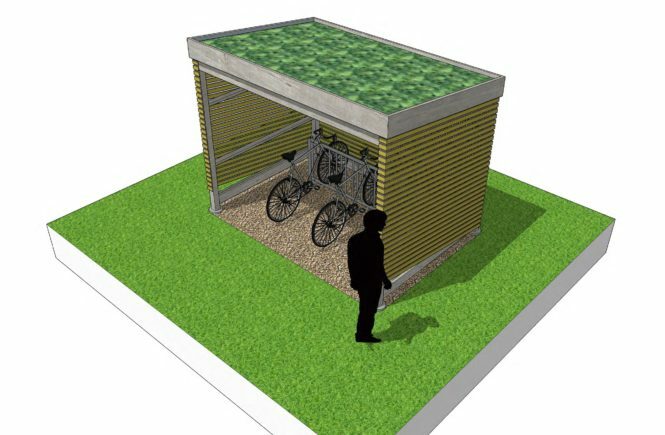 Using Minnesota ash wood, we’re building a green-roofed garden shed with a covered bike rack! The site will also serve as a learning site for students and community members to learn about invasive species and innovative uses for dying ash trees. That sounds like an amazing project! How can people get involved? Anyone can support this project by donating funds to our crowdfunding campaign or by volunteering at our shed building event! For questions or comments about this project contact Angela Gupta, UMN Extension, agupta@umn.edu, 507-280-2869. If you’d like to learn more about emerald ash borer or Minnesota’s ash resource be sure to check out Extension booklet: Ash Management Guidelines.